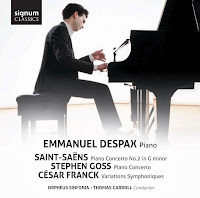 This new disc from London-based French pianist Emmanuel Despax is to some extent rather surprising. Known for his fine interpretations of the classic piano repertoire, you might have expected his first concerto disc to encompass perhaps Schumann, Chopin or Mozart. But instead he opts for two major French works, Saint-Saens Piano Concerto No. 2 in G minor and Cesar Franck's Symphonic Variations plus a new concerto commissioned specially for Despax from Stephen Goss. Despax is accompanied by the Orpheus Sinfonia conducted by Thomas Carroll. The disc is based on the live performance of the Goss concerto which Despax and the Orpheus Sinfonia gave at London's Cadogan Hall on 29 April 2013. They open with the Piano Concerto No. 2 in G minor by Saint-Saens. Written in 1868 in a remarkably short space of time, the work was premiered by the composer with the composer/pianist Anton Rubenstein conducting. The work has a slightly unusual shape in that the piece opens with an Andante Sostenuto, the longest movement of the work and each movement gets progressively faster with an Allegro Scherzando followed by a Presto. And the novelty does not stop there, because Saint-Saens opens the whole piece with a Bach-like peroration. Despax is brilliant in this opening, making the whole peroration feel like one extended improvisation. He makes the first subject of the Andante Sostenuto very poetic and beautifully shaped (it is in fact based on a Tantum ergo by Saint-Saens pupil Faure! ), whilst Despax brings out the hints of Chopin in the piano writing of the second subject, giving the whole great delicacy and charm. But when drama is needed, Despax displays fine power and urgency with some brilliant piano playing. The whole concerto is based around the show-off-y nature of Saint-Saens piano writing and Despax brings just the right combination of charm, brilliance and depth to the playing. The first movement is a remarkably long movement and, in fact, rather thoughtful in many ways. It is a testament to the skill of both Saint-Saens and to Despax that we don't really worry about this but just sit back and enjoy it. With the second movement, Allegro scherzando, Mendelssohn's fairies make a delightful appearance, with Despax's playing showing delicacy and charm. But he also brings crispness to the articulation, and careful nicely balanced playing which brings out the movement's lightness and wit. After a dramatic opening the Presto runs on tarantella-like, with Despax showing brilliance of touch with yet again that combination of crisp articulation, firmness of touch but lightness. When necessary, Despax can bring out the power in Saint-Saen's crashing chords. The whole work sees him and the Orfeus Sinfonia clearly enjoying Saint-Saens showing off. Stephen Goss's new Piano Concerto takes as its inspiration the work of designer Thomas Heatherwick, each of the four movements is inspired by one of Heatherwick's designs. The opening Fanfare is a portrayal of the Longchamp Store in Manhattan, the Moto Perpetuo depicts Bleigiessen an eight-storey-high sculpture made of glass beads hung on wires. The long slow movement Adagio was inspired by Heatherwick's Seed Cathedral created as the British stand at the Expo 2010 in China. The Finale is based in the sculpture B of the Bang. Throughout the concerto Goss's imaginative writing ensures that the fascination of Heatherwick's work is captured in sound. As a concerto, Goss's Piano Concerto could not be more different from the Saint-Saens. Goss neither takes the show-off-y route of Saint-Saens nor does he give us the grand pianist wrestling with orchestra, instead it is very much pianist as primus inter pares. Whilst the actual writing might not be baroque, the way Goss uses his solo instrument is very much akin to baroque writing. After a brilliant, brassy fanfare the Fanfare opens with piano chords supported just by tuba, with Goss relishing the dramatic contrasts between the different textures. The CD liner notes suggest that this movement is a portrait of the cityscape of Manhattan, and the movement does develop into some rather rhythmically jazzy material. Moto Perpetuo is inspired by the glittering of the glass beads of the Bleigiessen sculpture. The movement is one shimmering, glittering Tippett-esque texture, busy but delicate with fine figuration on the piano. The slow movement, Adagio, is the longest at nearly 15 minutes. Quiet, slow and delicate it reminded me of Bartok's night music writing. It is an exploration of stasis, but something is always happening. Many of the textures are magical with much of the piano writing in the upper register, and Despax displays superb control here. The Finale starts with a brilliant explosion, then the piano rumbles from the bottom to the top, clearly emulating the sculpture. The main theme is jaggy and jazzy, full of excitement and Despax's playing has superb rhythmic edge. Goss's concerto is a fascinating work, one which will repay listening. I would be interested to know whether it is likely to go into Despax's repertoire, or whether his playing of it is a one-off. Goss's treatment of the piano seems a world away from the 19th and 20th century concertos in Despax's repertoire. But then this sheer difference is part of its charm, and Goss is clearly a wizard when it comes to creating magical textures. Despax, Carroll and the Orpheus Sinfonia conclude with Cesar Franck's Variations Symphoniques which dates from 1885 during the composer's late period when he seemed to develop a magic touch and many of his works from the period have become classics. Again we have a change in the relationship between soloist and orchestra. Franck isn't really interested in showing off, though there is some in the piece, and the work opens with an interesting feeling of dialogue between Despax and the orchestra. The declamatory orchestral statements answered by Despax's fine grained and poetic piano. Despax's playing is very beautifully considered here. As Franck develops the drama, Despax uses crisp articulation for emphasis rather than anything more heavy-handed. The work finishes with Franck displaying a rather surprising breezy charm. Despax, Carroll and the orchestra are clearly having great fund with the movement. Throughout these pieces Despax is finely accompanied by Carroll and the Orpheus Sinfonia. They get to show their serious metal in the Franck, their joie de vivre in the Saint-Saens and their sheer technical brilliance in Goss's magical but tricky textures. In each they shine. This is a slightly awkwardly planned disc. Not everyone of Stephen Goss's admirers will want to have Emmanuel Despax playing Saint-Saens and Franck, and not every lover of French 19th century piano concertos will want to have Goss's concerto. But each has their attractions and I will certainly be returning to Goss's fascinating work.